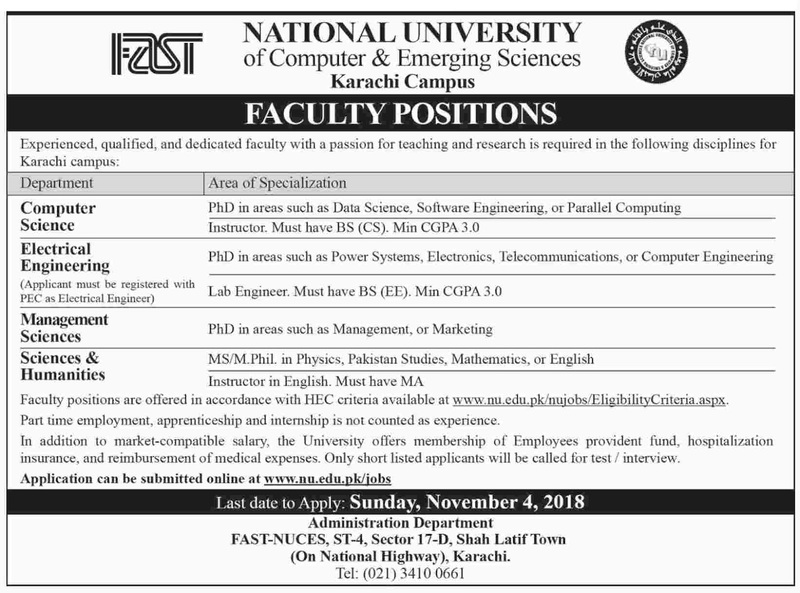 National University Of Computer & Emerging Science Karachi Sindh. Area of Specialization: MS/M.Phil. in Physics, Pakistan Studies, Mathematics, or English Instructor in English. Must have MA. Faculty positions are offered in accordance with HEC criteria available at www.nu.edu.pkinujobs/EligibilityCriteria.aspx. Part-time employment, apprenticeship and internship are not counted as experience. In addition to market-compatible salary, the University offers membership of Employees provident fund, hospitalization insurance, and reimbursement of medical expenses. Only shortlisted applicants will be called for test/interview. The application can be submitted online at www.nu.edu.pk/jobs. ST-4, Sector 17-13, Shah Latif Town (On National Highway), Karachi.